Northside Noodle Company of Iron Mountain, Mich., is recalling approximately 123 pounds of frozen pork and beef meatball mix. The product contains soy, an allergen not declared on the label. 1-lb. 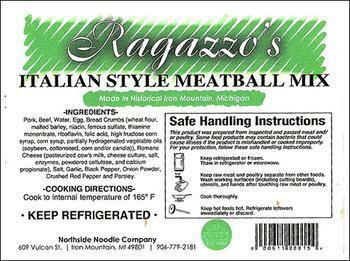 polystyrene foam packages containing “Ragazzo’s ITALIAN STYLE MEATBALL MIX,” with lot codes 2008, 2024 and 2044. The recalled product, bearing establishment number “EST. M10062” inside the USDA mark of inspection, was shipped to a retail location in Michigan. Consumers with questions about the recall may contact Mark Pugh at (906) 779-2181.